1. Equipment loan — If you’re looking to buy equipment to start your operations, it might help to apply for an equipment loan. This type of loan allows you to borrow money to buy equipment and use it as collateral for the loan. You can use the machines and earn from them while paying for your loan. 2. Short term business loan — Your business might also need sufficient cash on hand to sustain its daily operation. With a short term loan, you’ll have access to cash you can use as a working capital or for tax payments, payroll, debt refinancing and inventory expenses. As most short term loans come with higher interest rates, it’s highly recommended to pay back faster, preferably weekly or bi-monthly. 3. Line of credit — It’s also wise to apply for a business line of credit, which can provide you with cash you can use for different purposes. This can also be used as a source of working capital, fund for equipment purchase and many more. You can also opt to have an unsecured or secured line of credit, as well as a “one off” or “revolving” credit line. 4. Invoice financing — If you’re operating a B2B business, invoice financing is another option you might like to consider. This loan type allows you to take out cash in advance based on a percentage value of your expected receivables. Lenders of this loan type do not usually ask for collateral or a credit check for borrowers. With the plethora of business financing solutions on the market today, choosing the right loan type can be quite tricky. But if you have one or two of the types above, you’ll have enough funding for your company. Are you now planning to apply for one of these loans? If you are, don’t hesitate to visit the loansolutions.ph site to learn more about today’s leading providers of these credit types. Loansolutions PH is the country’s leading financial solution concierge, connecting those in need of funding with reliable lenders. Apply in as easy as 3 steps and follow up the status of your application using the Check Loan Status tool available on site. This article is contributed by Maricor Bunal. Mari writes for Loansolutions to help educate people in making informed-decisions on taking out loans and becoming responsible borrowers. Being the COO, she feels it is her social responsibility to do so. Learn more from her as she shares tips, advises and stories on finance. Also, she’s fond of 9GAG, so you might read some random stuff over here. The Philippines has been recognized as the Franchising Hub of Asia. It means that franchising as a business model is well accepted in this country. In fact, it is one of the top choices of any enterprising Filipino with money to spare and who wants to be conservative with his venture. As with any business, franchising has its share of traps and this article discusses that part which involves money. Indeed, it is one most expensive items you have to deal with when buying a franchise business and you will understand why later. Depending on how you look at it, this is money that you basically just throw out the window and into somebody else’s house. Fees and Charges in operating a franchise business must be thoroughly understood before embarking into the deal. The use of the company name and logo. This is very cool. Most of the time, clients and customers will never know that the business is run by the jerk-next-door. The Business System. This is the most valuable assets of a business and one of the most difficult to perfect. This is one area also in which buying a successful franchise business is worthy compared to doing it from scratch. Having a proven business system eliminates a lot of guess work and mistakes that go with running a business. A successful and highly experienced franchisor can tell you the things that work and those that don’t. Training and Support. One of the nice things about joining a franchise is the support system the company offers. A good company should take you seriously as a partner in the business. That is, they should have a stake in your success. Tips on Franchise Fee: It’s very hard to tell if the Franchisor’s Franchise Fee is fair or not. You have to check what its competitors are offering and make sure that you compare apples to apples. Never, ever buy a franchise just because is it something you can afford. There are more things to consider than just the franchise fee. This is one thing you really have to think about. Royalty fees come in various forms, such as the following. Percentage of gross sales. That is, they get a piece of the pie even before the government gets theirs. Naturally, you — as the operator of the business — get the last piece. The worst royal fee I’ve seen so far in the Philippines is one which is based on the gross sales + VAT. Percentage of purchase. This one is the opposite of the royalty fee mentioned previously. Instead of taking it from the items you sold, they take it from the items you buy from them. Technically, this should be lower compared to the other type of royalty fee. Fixed recurring fee. Which is not really a royalty fee but more like a rental or retainer’s fee. Tips on Royalty Fee: Take a good hard look at this item before you consider buying a particular franchise. This is one area that causes a lot of franchisee regrets. Franchising is supposed to foster a win-win partnership, right? This part is a real bomber because it appears to be legitimate. Like the royalty fee above, marketing fee ( or sometimes named advertising fee) is charged on the franchisee on a periodic basis, usually monthly. This is supposed to help your business by driving clients and customers to your doors, right? But… there are franchisors that collect marketing fee who never run any single ad, ever! Tip On Marketing Fee: Have you personally seen for yourself a single ad or marketing campaign by that particular franchisor? How often do they run that campaign? Will it benefit your own franchise operation? You should have recovered your expenses and gained from the past years of operating the franchise business. The renewal fee should be lower than the original franchise fee. Tip on Renewal Fee: Everything else being equal, you should select a franchise that offers the longest renewal term and with the lowest renewal fee. Doing the numbers before embarking on a franchise deal is one of the smartest things you can do to your planned business venture. The concept of franchising may be old, but its adoption here in the Philippines is relatively new. As such, there are a lot of unscrupulous businesses disguised as legitimate franchises and who are only after the money of unsuspecting clients who don’t know how to evaluate a business opportunity. Here at NegosyoBuilder.com, we want you to steer clear of that situation. In the next couple of articles, we will be featuring business and franchise opportunities that are available in the Philippines. As usual, we’ll guide you with some tips and point out the traps to avoid. Did you know that an estimated 2.2 billion people from all over the world are already using the Internet? Well, not all of them may become your customers, but it means that the Internet will become more and more part of our daily staple. Here at Negosyo Builder, we believe that the top 3 reasons why your business should have a website are as follow. 1. Your customers are online. New customers. These are the ones who have never done any business with you yet. They may know you from someone else, or they don’t know you at all. Customers who are new to your place. A few examples: real estate buyer from another city, business traveler, etc..
Customers who are looking for an alternative solution. They may be dissatisfied with their current supplier or they are simply looking for the best bang for their investment money. Fact: Your customers are online. Are you? These are the type of customers who tend to use the Internet and do their research to find out about the businesses they will be dealing with eventually. They can be described by a single word: skeptical. And yes, consumers these days are more skeptical than ever. They refuse to be fooled anymore. They want to know more and more about you before they decide to hand you their money. They won’t know you. Did you know that the About Us Page is one of the most visited pages in any website? Customers want to know who’s behind a particular website. They won’t trust you. There is no basis of establishing trust in the first place. Remember your mom’s advice about talking to strangers? Like it or not, in the eyes of the customers, you are a complete stranger until they actually start doing business with you. They won’t like you. Did you ever like a movie which you haven’t seen yet? Unless you are blind, I guess you’ll agree that the answer to that question is no. Unless they can see your virtual face, your online customers can’t possibly like you yet. Would you buy a PC or a piece of software from a vendor that doesn’t have a website? Would you enroll a computer course from a school that doesn’t even have a website? Ironic as it may seem, but this is happening all the time in the Philippines. There are so many businesses with very low online credibility, and yet have the audacity to ask for your business. This is like going to the gym because you wanted to flatten your belly, and perhaps put on some abs — though not necessarily six packs since you are not really into boxing. You have all the motivation in the world to lose those belly fats until the front desk staff introduces you to your instructor. Your eyes begin to scan his figure, not because you are gay 🙂 , but because your mind is searching for traces of credibility from someone who is suppose to give you the right instructions. And, oh my, he happens to look like he is 7 months pregnant! Where’s the credibility in that? That’s what I mean by very low in credibility. Am I dealing with the right people? Can they deliver what they promise they would? Are they trying to scam me? In the online world, your own website — not your Facebook Page, or your Twitter account — can build your brand and credibility for you. The 2012 Nielsen Advertising Survey found out that 58% of the online consumers around the globe are more likely to trust a company that has its own website. Many of your website visitors may not be buying from you yet, but these people can be looking at your website in search of information. And the more you provide them with the information that satisfies their curiosity, the more you reinforce your online credibility. The same Nielsen Advertising Survey conducted last year found that 92% of the online consumers worldwide say they trust word-of-mouth and recommendations from people they trust more than they trust the traditional forms of advertising. Your potential customers also rely heavily on customer reviews and feedback from other third-party websites. That’s how intelligent customers are now becoming. Through your website, your potential customers can help you share the good things about your business without you spending a single dime. And with social sharing features in place, you also make it easy for a satisfied customer to recommend your business to his friends and his friends’ friends. You could be the next business rock star! Who knows? But it has to start somewhere: with your very own business website. If the answer to that question is no, I don’t have anymore reason and motivation to put up this website. The NegosyoBuilder.com website is about building and running all aspects of an online business, with a little diversion on traditional businesses occasionally. But for someone to be asking, “How do you make money online?” I think he is looking for an answer that is easier to digest. Mind you, it’s not a stupid question. It’s a curious beginner’s question which deserves a straight-forward, but intelligent answer. Here is my attempt to answer the question in a way that any sixth grader would understand. Here’s how you can make money online. In a traditional business, you make money by selling products, services or a combination of the two. The same thing happens when you go online. In a traditional business, you have a physical store sitting on a specific location – that’s why they also call it bricks-and-mortar – where people can go and buy your products. If it’s a physical product, they can touch it, smell it, or even kiss it. Online, your prospects (also called suspects if they are not buyers yet) can browse from the Products Catalog that you put from your website. With a few clicks, they are all set to place their orders and buy from you. I’m talking about selling products. Your job now is to imagine how it would be in the case of services. Become an author and write your own ebooks. See lulu.com for details. Run a membership website where only paid, subscribed members can have access to specific contents. Offer Webinars on topics where you have expert knowledge. I’m not sure if it is still the case today, but my favorite local newspaper company, The Philippine Daily Inquirer, at one point once admitted that the cost of producing a particular issue was actually greater than the price they were selling it to. Meaning, they were actually selling at a loss. But how do you think they survive until now? Here’s the secret: They don’t make money by selling newspapers. That’s the newspaper boy’s business. They make money – and lots of it – by selling advertising spaces at various places in the paper. Still wonder why bad news is everywhere whether in print, radio, TV and the Internet? Hint: Bad news is the real news. If you have a website, you too can act like a small media company and deliver ads your web pages. It’s one of the quickest and easiest monetization strategies that anyone can do. You can contact an advertising agency’s website and simply sign-up for their program. Tip: One of the mistakes new publishers make is they get too excited with this concept and immediately rush to fill their websites with various ads. This is not advisable if your website is relatively new with only a few pages to show. It’s best to work on your content first. Make lots of articles so that you can have a sizable base of audience who keeps coming back. Once you start developing your fans, that is when you should start populating your content with ads and put those ads only in strategic locations of your website. Here’s a sampling of the familiar middle men: real estate brokers, stock brokers, and insurance agents. There are people who hate the middle man. But I’m here to tell you that the middle man – if you know how to pick the right one – could make your business transaction faster and your success easier. People may criticize him for his lack of boxing skills, but Bob Arum is one of the finest businessmen in the world of boxing. As a promoter, he simply gets things done and makes millions of dollars happen – for everybody. So don’t be afraid of the middleman. Instead, learn how to make use of his talents, skills and services to your advantage. One of the ways you can make money online is by helping businesses sell their products and services. The image above is courtesy of Wealthy Affiliate Open Education Program. It shows how you can make money by referring products from Amazon. The referror sends traffic (site visitors) to the merchant’s website. This can be initiated in different ways like links from a website, emails, Facebook, Twitter or online ads campaign. When the visitor takes action like he buys the recommended stuff or signs up for a subscription, the referral agent gets compensated by the merchant. Think of it as the merchant’s way of saying, “Thank you for sending us the traffic.” In the online world where every business is hungry for attention, the modern middleman could save the day for the merchant. The nice thing about building an online business around this concept is that it doesn’t require much financial capital to start with, therefore you minimize the risk of going bankrupt with the venture. 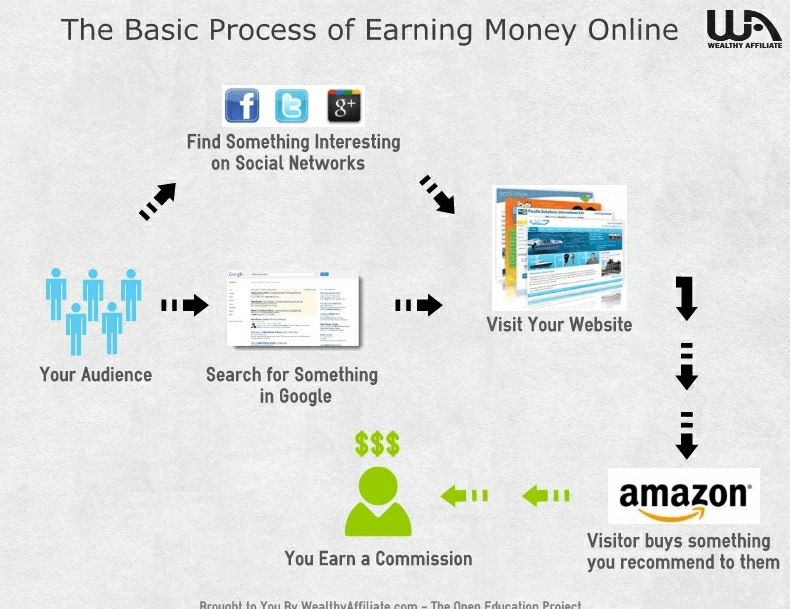 So there you have it, the three ways you can make money online. Which one do you think is a best fit for you? Do you see yourself implementing all three in one website? Well, that’s possible, too. Let’s say you are to start a small business anytime soon, would you go for a traditional business — with an actual physical location — or pick an online business concept? If you ask me, I’m bias, of course. I would always pick an online business over the one which is traditional, bricks-and-mortar. It’s the smart choice and later I will elaborate why by comparing the two types of businesses. First, let me lay down the basis of comparison just to make sure we are comparing an apple to an apple. There are many forms of businesses, but let’s make this simple. Consider a small and familiar retail outlet. It could be a mom-and-pop bookstore, franchised store operation, or anything you are already familiar with. They say the three most important factors to consider when buying a piece of real estate are: location, location, location. Many traditional businesses like retail stores and restaurants are overly dependent on the location. Being in the wrong location could mean committing financial suicide for your business. Space rental, renovation, period maintenance — you have to consider these things in a traditional store setup. Furthermore, you’ll need a signage, furniture or fixtures, display areas, POS machines and other things needed to keep your business in operation. In an online business setup, your website is your store. Yes, you still have to maintain it, keep it looking good, update your product listings and prices, or run a few articles. But in general, comparatively cheaper to do or buy and you won’t be sweating it out when doing these activities. In general, a traditional store requires a much bigger manpower to operate than an online store. More often than not, the size of the store’s floor area is directly proportional to the number of employees needed to operate the store. I once discussed with a medical representative about the possibility of setting up pharmacy. The one thing I can’t forget was his advice on inventories: As much as possible, you have to keep a wide range of different kinds of medicines in your store because once your customer goes there and you don’t carry what he is looking for, he would go to your competitor and might never come back to you again. Keeping a large amount of inventory is one of the burdens you have to bear for running a traditional store. With an online business, this one is less of a problem. You can start with minimal or even zero inventories and keep it that way. There are so many ways of doing this. Bricks-and-mortars operate in the usual and standard business hours. Your staff have to go home, too. An e-commerce store, on the other hand, can accept orders round the clock, 24/7 – even while you sleep. That means, passive income coming your way. Since it is confined to a particular location, a tradition business can only serve a very specific, regional market. The only way to serve more clients and customers is to setup branches in different locations. This restriction is removed if your business is online. You can choose to serve nationwide or even to do business internationally. As our tagline says, “Earn Global. Live Local.” That’s easily possible with an online business. Hobbies are as diverse as the people who pursue them. Apart from keeping his day job, my friend Albert is also into mountain climbing, extreme sports and other outdoor activities that are physically challenging. On the other hand, my friend Rex takes pride in his collection of tropical fishes that are truly a stress-reliever, which is especially helpful when coming home from work. Most often than not, a person who is engaged in a particular hobby is doing it out of pure pleasure derived from the activity. Making money is usually out of the equation. You can make money by telling the world about your hobby. Click the image above or this link to see how people around the world are doing it. Herein lies the rub: While pursuing a hobby is fun, it can also be a financial drain. Now, what if you can turn your hobby into a source of extra income or even a full-pledge business? For some hobbyist, it may sound counter-intuitive; perhaps, even defeats the purpose of doing the hobby. But there are those who are thinking along this line: there’s nothing wrong about being compensated for doing something that you love to do so you can do it more. 1. Learn the Art and Science of Selling. That’s the very first hurdle you have to overcome. You have to accept the fact that selling is an essential part of any money-making endeavor. Whether you are aware of it or not, your everyday activity already involves selling. Convincing the kid to eat his breakfast; getting everyone in the office to agree with your idea; asking for a raise or promotion — these are all sales activities. Even churches and non-profit organizations have to sell too in order to get some funding. So why not get comfortable with it and take your hobby to the next level? Identify your target market. Who are your prospective clients? Can you come up with a profile of a typical customer? Research the competition. Can you identify the known market leader in your area? Competition is not entirely a bad thing. For one, it indicates there is a market to be served. How much would you charge for each individual product or services that you offer? A pricing strategy could spell the difference between an amateur and a pro. Now, this already sounds like real business. Remember that your final price should include all costs incurred, including your own labor, plus profit margin. 4. Identify the level of success that you want. You have to be clear about the meaning of success and having it all. Your hobby-turned business could still consume your time and energy. Do you really want to do your hobby all day, every day in order to please your customers? You should strike a balance in order to maintain your sanity and keep the same level of enjoyment you have over your hobby. You can share your experiences. You can teach people about your hobby. This is another business opportunity apart from selling your products and services. It establishes you as an expert or authority in that field. You can reach a wider base of audience and clients, even globally. It’s your sales tool. Or, your sales man who never goes to sleep. I can go on and on with the list, but the point is having a website offers a lot of advantages. 5 easy steps to build your own WordPress-based website. Simple Website Building Tool that anyone can use. Highly recommended for non-technical people. Accepting Online Payments via PayPal. A website is your main doorway to the world of online business. Is your business already online? If not yet, that’s understandable. A lot of small business owners — I’m talking about traditional, offline businesses — are still taken aback when the thought of going online comes up. They don’t know how or where to start. They have no technical background such as programming, HTML, CSS and all that stuff. The last reason is the easiest to solve or justify. I believe that no matter how frugal the entrepreneur is in handling the financial resources of the business, once it’s demonstrated that a website can contribute positively to the bottom-line numbers, he would be convinced to jump right in and invest in having a website. SBI has all the right tools you need in building a successful online business. So I think the very first task of the entrepreneur before he embarks on having a website is to really asses the significance of having it in the first place. One of the ways you can do this is to look at your competitors, especially those who are run by the younger breed of entrepreneurs. Are they online already? If so, how was the effect of having that website on their business versus not having it? If you are eating their leftovers as a result of that website, maybe you should be online now before it’s too late already. As to the first two reasons, consider this: What if I can show you a tool that allows you to build, not just a website, but a real online business, without any programming skills required on your end, would you give it a try? And if you are concerned about the price, worry no more! Your monthly investment is only less than 1 USD per day! This tool simply works! Believe me, I’ve never seen anything that compares to this product. You can use email. You need an email address and you have to know how you use an email software. You can pay online. That means having a credit card or a debit card. But I highly recommend that you get a PayPal account for better protection. Site Build It (or simply SBI from now on) is a complete set of online tools that you can use to create a successful online business. SBI is not just your usual online Site Builder. With SBI all the right ingredients are already there at your disposal. I bet you can’t find those tools bundled in WordPress or Joomla or Drupal! Click here to compare WordPress with SBI. And by the way, those are just a few of my favorite tools in the package. There are a lot more. I think you should take a video tour of the product to see what’s in store for you at SBI. One of the reasons why SBI is successful as a product is that it is so easy to use. You don’t need any prior knowledge of HTML, CSS, FTP, Scripting, SQL and all those technical stuff just to be able to use the product. With SBI, you focus on the content: your articles and your message. These are the stuff that cement your online relationship with your clients and customers. SBI takes care of the rest. It’s really like driving a car. If you step on the brake pedal, you know that the car slows down until it stops moving. You don’t care about the exact mechanism of brake system like the auto-mechanics do. You just know it works. I think this is the most important part of the package. SBI is loaded with educational materials and videos called Action Guide that help you in building a successful online business. It’s like having an online mentor who will guide you every step of the way. SBI also follows a proven and tested formula to ensure your success online. If you follow this system, you not only minimize errors, your chances of success also increases. Think about this: your monthly investment with SBI is less than 1 USD per day! On top of that, the company also gives you a 90-day money-back guarantee. That gives you three months to try it and study it yourself. If within that time-frame you realize that it’s not the tool for you, you can claim your money back! When you sign up for SBI, you will be getting a free domain name, too. If you decide to stop using the tool within the 90-day period, the domain name is your… you can do whatever you want to do with it. That’s the company’s way of saying thank you for trying the product! I am a firm believer in idea that the entrepreneur should not be wasting his time doing the dirty works (e.g. : clerical works, sending fax, etc) of the business, but instead shift his focus on the bigger picture and the overall direction of the business. When it comes to making a website for your business, you may want to outsource that task to a more capable service provider. That is, if you are willing to invest some money also. But if you are on a tight-budget, there is a tool that can help you do it and it’s very effective. I would even venture to say that in a lot of times, using SBI is even more effective than hiring a web professional. I love SBI and once you begin using it, you will love it too! Lombardo contends that there is more to Estate Planning that goes beyond expertise of lawyers, accountants, financial planners and investment advisors. Funny but no matter how sophisticated they are in dealing with the issue of wealth transfers (meaning passing it from one generation to the succeeding generations), wealthy families fail miserably in dealing with the emotional issues the family members have to deal with. The family’s Great White Elephant is sabotaging the whole process of succession planning. He also identified the three common reasons why wealthy kids hate their parents. A white elephant is a metaphor that represents something which, when possessed, causes burden instead of giving value (like hapiness) to its possessor. 1. Wealthy parents don’t say, “No” to their kids. You know… the kind where parents give anything that their children want. This is a perfect recipe for raising spoiled kids. But wealthy parents can’t seem to connect this relationship. They say too much love can kill you, but I think it’s exaggerated. However, here is a fact: too much love can spoil your kids. 2. Not spending time with their kids. Acting as if everything revolves around money is especially dangerous for the rich families. A lot of wealthy parents seem to be addicted to money that to the point of relegating time with their kids on the side lines. While many of them think that they can make up for the lost time by giving their kids money, well it actually only adds insult to the injury. “Money is the wrong currency to pay back lost time,” Lombardo said. Author’s Note: Rich or poor, I think once you become a parent, you should take to heart the meaning of song, “Cats in the Cradle.” The song is rock, but it nails down the message quite effectively. Watch the video below and pay attention to the lyrics. 3. Societal Influence. What’s true in about people’s attitude toward the rich in Canada is also true here in the Philippines. Realizing that the society at large actually makes fun of rich kids, wealthy parents instruct their children to hide their wealth to blend naturally with everyone. In other words, these kids spend a large part of their growing up years with their real identities camouflaged so they can be accepted by the crowd. Unfortunately, children grow up to resent their parents for teaching them such a “fake” display of behavior. In the Philippines, the society’s influence is even worst. As a nation, we hate the rich. However, here’s one irony that bothers me the most: We hate the rich, but at the same time, we also wish to become one of them. “The Great White Elephant: Why Rich Kids Hate Their Parents” can be purchase at http://www.veritage.ca. Visit Franco Lombardo at his website.